Well, it is time to add another weekly habit to our 52 Weeks to Better Nutrition and a New You series. Remember the theme of these are simple, small habits that add up to big, sustainable change. 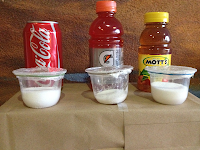 This week it's time to look at reducing liquid sugar intake. Many people consume pounds of sugar each year in their beverages and as a result, gain pounds of body fat. 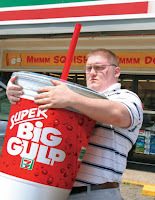 Even people that don't eat a lot of junk food and sweets seem to still love their sugary drinks. It often starts as children with pop. Brad King author of "Fat Wars" accurately described pop as liquid candy. As people get older, some continue the pop diet. Others move to more "sophisticated" beverages such as iced tea, juice, alcoholic beverages, "energy" drinks and the over-priced specialty coffees. While these drinks may not seem as bad as pop, many are loaded with sugar and will hurt your health and your wasistline while costing a lot more than pop. "But I'm not getting fat!" Some people who are very active or who are blessed with naturally super-charged metabolisms believe they can justify their sugary beverage intake because it is not making them fat. However, even if you don't get fat, you are still unnecessarily increasing your risk for diabetes, you are still wrecking your teeth and you are still establishing an eating habit that will make most people fat in the future. Many of today's skinny-fat adults were yesterday's skinny teens/young adults who bragged about being able to eat and drink junk without getting fat. I'll expand on this more in the future, but sport drinks are not a healthy alternative to pop. Yes, they do have sugar and electrolytes (and blue # 4) and this can help during or immediately after intense training. However I see many people (athletes and non-athletes) drinking sport drinks with their lunches and throughout the day as if these were a "healthier alternative". Don't let marketing fool you. 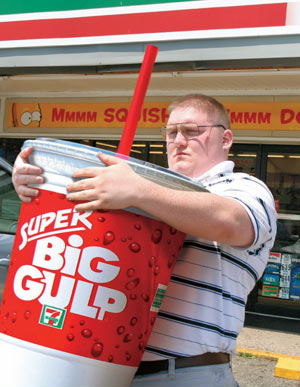 Now at this point, I'm not asking you to stop drinking your favorite sugary beverages completely. Remember this series is about consistently taking baby steps. Therefore this week's habit is to remove 1/4 to 1/3 of your current calorie-containing beverages and replace them with water. For example, if you currently drink 3-4 pops per day, remove 1 pop per day and replace that amount of liquid with water. If that is still too much for you, remove a little less. The point is to make a small, permanent change to your nutrition. Taste buds remain spoiled. The purpose of these habits is to re-train your taste buds to enjoy real food. In some cases, people who use artificial sweeteners actually eat more calories. Some have hypothesized that this is due to a weird reaction where the body senses it is not getting calories in this item and seeks to eat more to replace them. However it may be simply that people feel they can justify their consumption of other fattening foods. These drinks are still not healthy. The whole topic of artificial sweeteners is very controversial. There are qualified, experienced and successful health and nutrition professionals on both sides of this issue. When it comes to health topics where we don't seem to have a clear-cut answer, my philosophy is to not be part of the experiment. I would rather avoid/limit artificial sweeteners at least until we have a more conclusive understanding of the short and long-term health implications.